I hate wasting food. Always have, always will. This holds true even for the sweets and not-so-great-for-you treats. (I’m looking at you, gingerbread houses.) 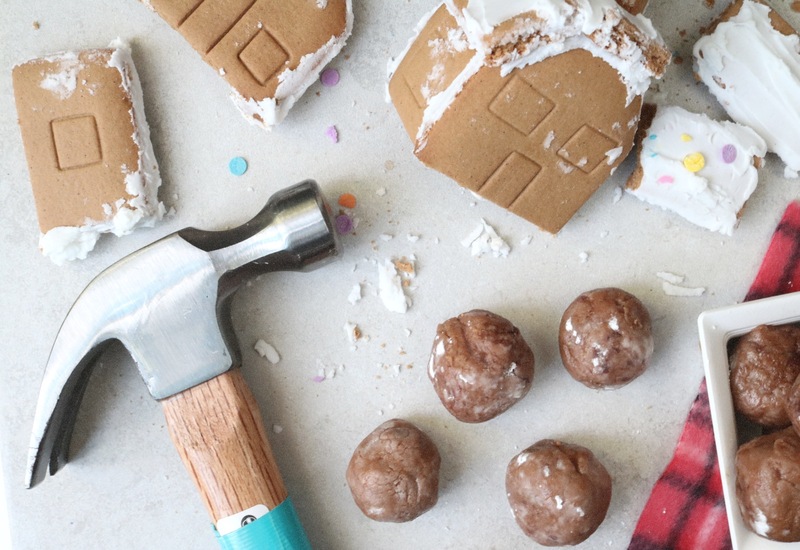 And since we all know the holiday season is FULL of said treats… I couldn’t help but brainstorm a way to put a leftover gingerbread house to good use. After all, as charming as they can be, gingerbread houses are practically impossible to eat. They’re rock solid by the time Dec. 25 rolls around. Luckily, this post-Christmas activity can save your beloved creation from the trash and/or the road to staleness. Also, truffles. Also, whiskey. This one’s a no-bake recipe, so you really don’t have an excuse. Once you turn the a gingerbread house into crumbs, all you need to do is mix, roll up, and eat. Count me in. * This is the measurement after running pieces of the gingerbread through a food processor or blender. I’d recommend taking a hammer to the house and breaking it apart into smaller pieces. This will make it easy for your processor/blender to handle the tough cookies and hardened icing. I’d recommend removing any super hard candies like mints and candy canes, though. You can always crush that up separately with a hammer, but your blender or food processor won’t be too thrilled. 1. Combine all of the ingredients into a bowl. Mix well. If the mixture is too soft, slowly add confectioners’ sugar in small increments. 2. With clean hands, roll into 1-inch balls. 3. Lightly dust with confectioners’ sugar. Feel free to roll the balls in a plate of confectioners’ sugar, too. 4. Place on a baking pan lined with parchment paper. Let sit in the refrigerator for 30 minutes. If you’re not feeling the whiskey or bourbon, simply omit it or use coffee. The recipe will just taste just as fab, I promise. For the record, I tried out this recipe twice — once with butter and once without. I’d definitely recommend skipping the butter; it hardens up better this way.